Budget 2015 had introduced a new section 80CCD (1B) which gives deduction up to Rs 50,000 for investment in NPS (National Pension Scheme) Tier 1 account This new deduction can help you save tax up to Rs 15,600 in case you are in the 30% tax slab. The question is should you take advantage of this new tax deduction and invest in NPS? NPS has not taken off as expected and finance minister by giving this additional tax saving option is trying to give it a push. We all know how many people invest blindly in poor schemes just to save tax. This post is to analyze if it makes sense for us to invest in NPS to save additional tax. For our calculation we assume that Amit is 30 year old and would retire at the age of 60. So he would make investment for 30 years. Also the tax bracket remains 31.2% at the time of withdrawal at the age of 60. Alternatively, Amit can pay tax on this Rs 50,000 and invest the remaining amount (i.e. 50,000 * (1-31.2%) = Rs 34,400) in Equity Mutual fund which gives return of 12% annually. As can be seen in the calculation above, the final amount generated by NPS is 90.47 Lakhs while in case of equity mutual fund its 92.98 Lakhs. Additionally, in case of NPS you can withdraw maximum of 60% of the total maturity amount which is 54.28 Lakhs. 20% of NPS corpus would be further subjected to 31.2% tax, which means you would be left with net amount of Rs 48.64 lakhs after tax. Rest Rs 36.19 lakhs should be used to purchase annuity. The proceeds received from this annuity is again considered income and taxed according to marginal tax rate. Also annuities in India have not evolved and the return from varies in the range of 6% – 7%. This makes it a sub optimal investment choice. In case of investment in equity mutual fund, the long term capital gains in equity mutual fund is taxed at 10.4% (from FY 2018-19). At maturity you have Rs 93.39 Lakhs which after LTCG tax would be Rs 84.38 Lakhs. If you see the taxation of both NPS and Mutual Funds have changed in last 2 years. So a long term decision (30 years in this case) cannot be made just based on present tax rules. 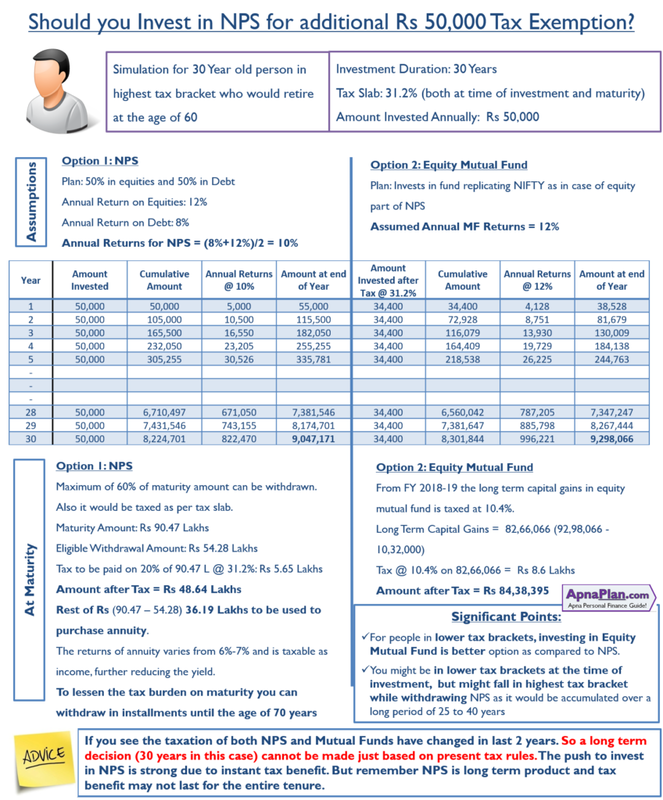 For people in lower tax brackets, investing in Equity Mutual Fund becomes much better option as compared to NPS. This is because the tax outgo is lesser and hence more money is invested in MF. As the duration of investment goes up the mutual fund option becomes even better due to compounding at higher return rates. You might be in lower tax brackets at the time of investment; but might fall in highest tax bracket while withdrawing NPS as it would be accumulated over a long period of 25 to 40 years. With the new rules you can split your withdrawal till the age of 70 – lessening you tax outgo. You need not purchase annuity if the NPS maturity corpus is less than Rs 2 Lakhs. Should People nearing Retirement Invest in NPS? I often get queries by people near retirement that if they can and should open NPS account to get tax benefit u/s 80CCD(1B). Below is my take and you can take your decision accordingly. Anyone who is below 65 years of age can open NPS account – so technically you can open your NPS account. Assuming you are 62 years or more and the tax exemption stays for next few years. You can invest 50,000 every year for 3 years. With 10% annual returns your NPS maturity amount would be less than Rs 2 lakhs. As per rules, you need not purchase annuity if the maturity amount is less than Rs 2 lakhs. So after retirement you can withdraw the amount without much tax burden. You can also time the withdrawal to a year (but before reaching 70 yeas of age) when the tax liability is lower or split the withdrawal in 10 installments. Even for lower age people you can start investing Rs 50K for tax saving until its provided for and keep account active by contributing minimum of Rs 1,000 per year. 6 Changes in NPS Rules in 2016 & How it Impacts You? Sir I am defence personnel can I joined NPS .Will also govt contribute same . But if you consider following points then it will be excellent. 1. What will be the effect over maturity amount, if we invest the tax saved by NPS (15600/-) to equity/debt/other? 2. Consider the breaking up of maturity amount in second option (ie when we invest 34600/- in equity) into the 40% & 60%, so that it will be more camparable & understood. For example we get 6-7% over rest amount by NPS but with Option-2 it will be 10-12%. I have completed investment of 150000/ under 80C. Is it allowed to save 50000 by investing in NPS apart from investment of 150000 under 80C. I am a student and have just started working and hence do not know much about the products in Finance. But I was just researching about NPS and came across the EEE status. You have attached the calculation in the above article wherein a tax is charged at the withdrawal. I am confused. Does EEE status not mean tax exempt at all three stages? If today the withdrawal is tax free is then investment in NPS worth and beneficial? I am above 65 years. I do have a nps account. Can I invest upto Rs. 50,000/- and get tax benifits under sec 80 CCD (1B) this financial year ?? ?